This is the original, or the first of the two Fort Williams built in 1696 by the British East India Company. It was constructed under the supervision of John Goldsborough. Sir Charles Eyre started construction near the bank of the River Hooghly with the South-East Bastion and the adjacent walls. It was named after King William III in 1700. The original building had two stories and projecting wings. An internal guard room turned out to be the Black Hole of Calcutta. In 1756, the Nawab of Bengal, Siraj Ud Daulah, attacked the Fort, temporarily conquered the city, and changed its name to Alinagar. This led the British to build a new fort in the Maidan. The Old Fort was repaired and used as a customs house from 1766 onwards. 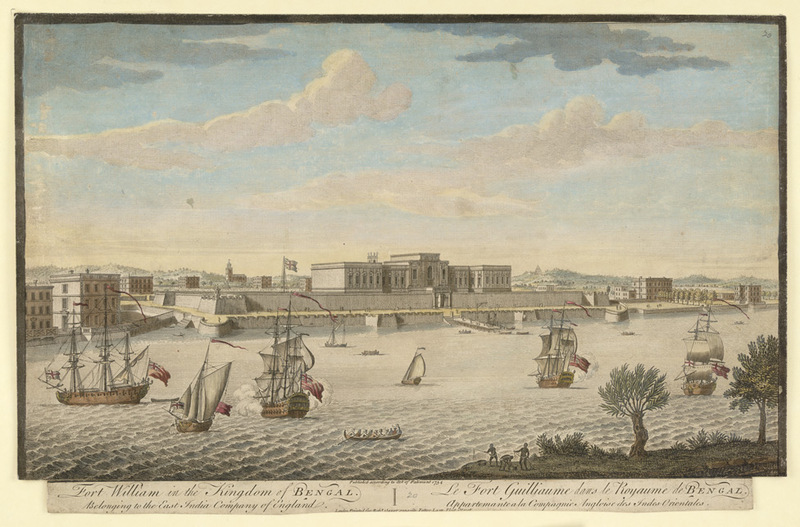 Coloured engraving of Fort William in Calcutta by Jan Van Ryne (1712-60 published by Robert Sayer in London in 1754. This entry was posted in Defence, Forts, Military Installations and tagged Alinagar, Black Hole of Calcutta, British East India Company, calcutta, fort william, Hooghly King William III, Jan Van Ryne, John Goldsborough. Sir Charles Eyre, Nawab of Bengal, old calcutta, Siraj ud-Daulah.